Quick update on where we stand at this point. Double top (purple lines) with 100% and 200% targets highlighted. 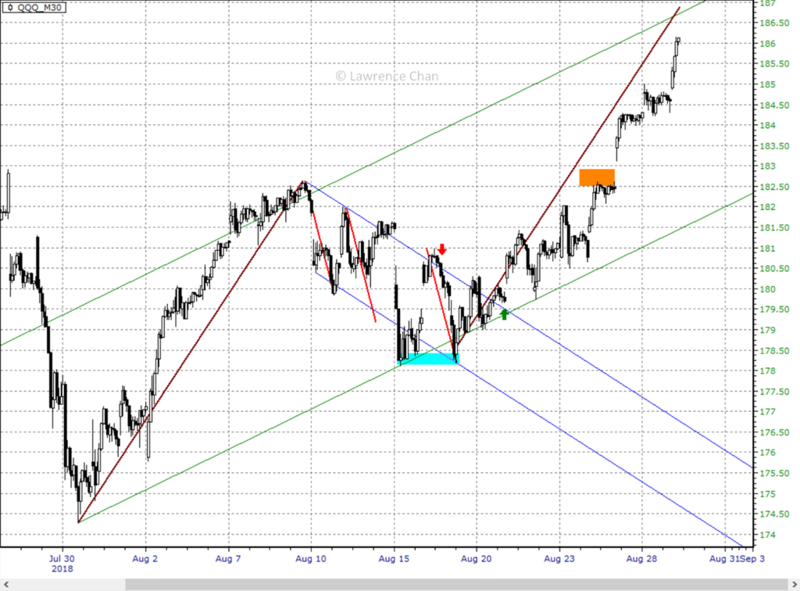 Three pushes up (orange lines) with starting point highlight by the horizontal cyan line on the left. In combination we are looking for the cyan box to be tagged soon. My guess is Friday or Monday. 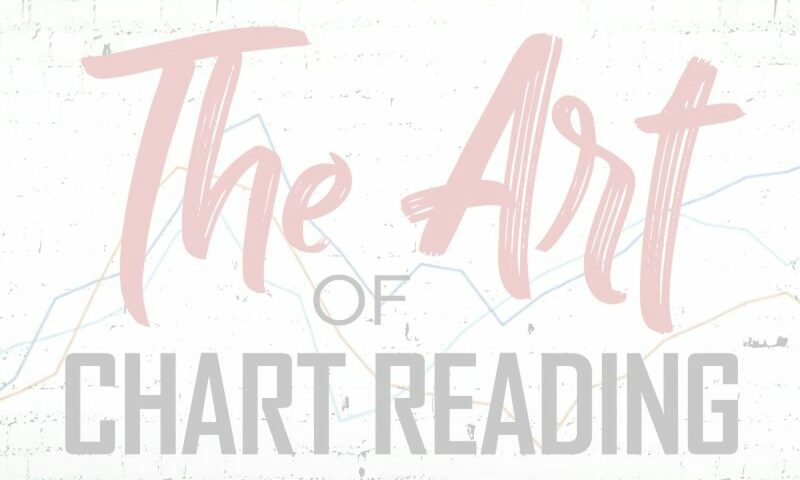 My book The Art of Chart Reading is going to be on sale at Amazon for 3 days only starting tomorrow. Take advantage of the discount event and get your own copy! Same chart as the one posted back in Aug 18 with new highlights on what to watch out for. 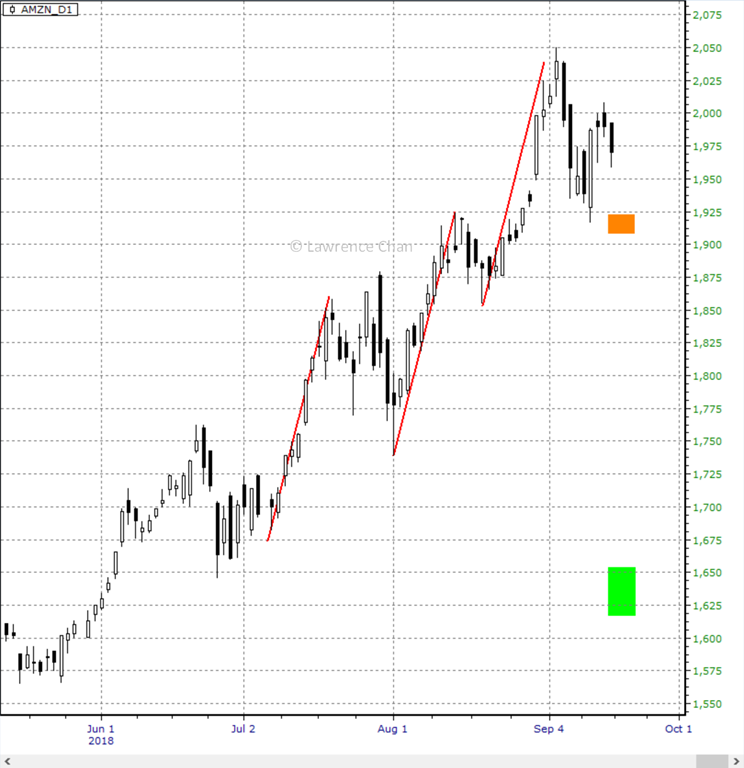 Orange down arrows mark the potential double top. 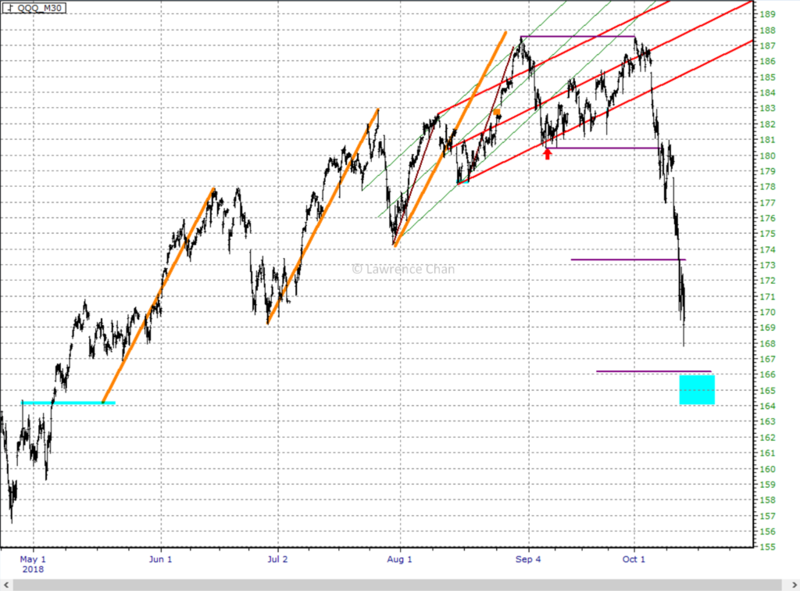 The same support zone I projected is now at risk to be taken out. Until TSLA trade back above the red down trendline and close above that on weekly basis, without breaking the up channel support, Tesla is at best going sideway in coming months. Breaking below the bottom boundary of the blue zone is a confirmation of the double top setup with much lower price level in play. Following is the weekly chart of Dow Jones Industrial Average. 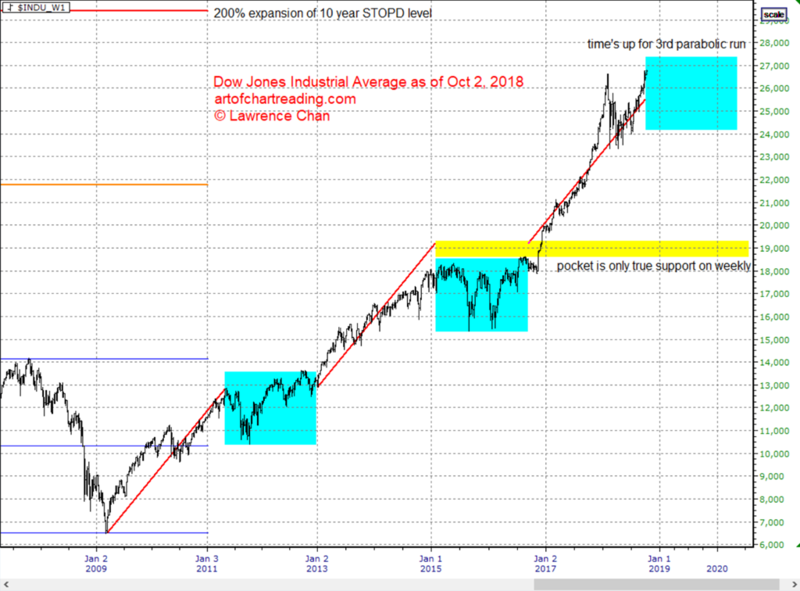 The 10 year STOPD level projection tells us where the likely maximum boundary for the current 10 year run will be. It is marked by the red horizontal line at the top. Parabolic run exhausts itself on the 3rd round most of the time. We are reaching the end of the 3rd round. Last 2 corrections / consolidations after each run last about 2 years. 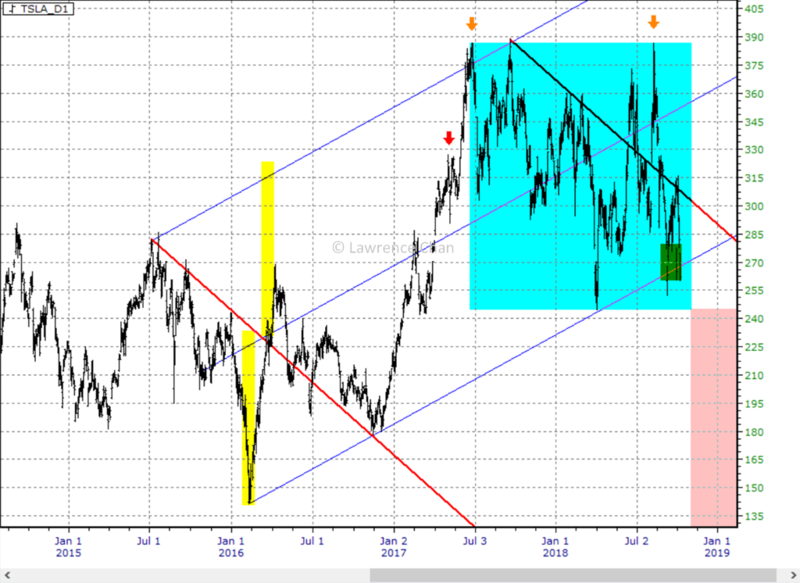 It will be tough not to get a steeper correction. Another great example on how not to trade with your opinion. Blue up arrow marks the retest of the orange zone (and the flush low). 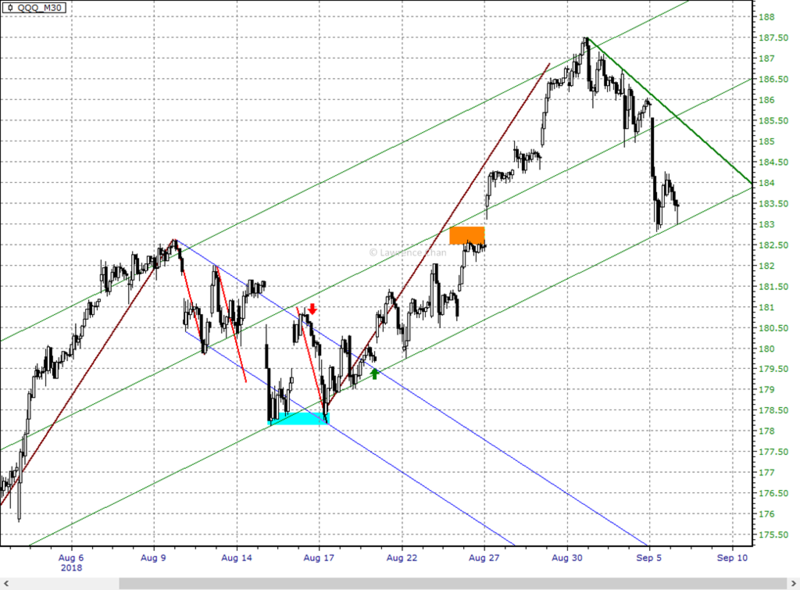 Confirmed by close that the orange zone holds so a run for the previous swing high started. Many readers are asking for short term analysis on Bitcoin. 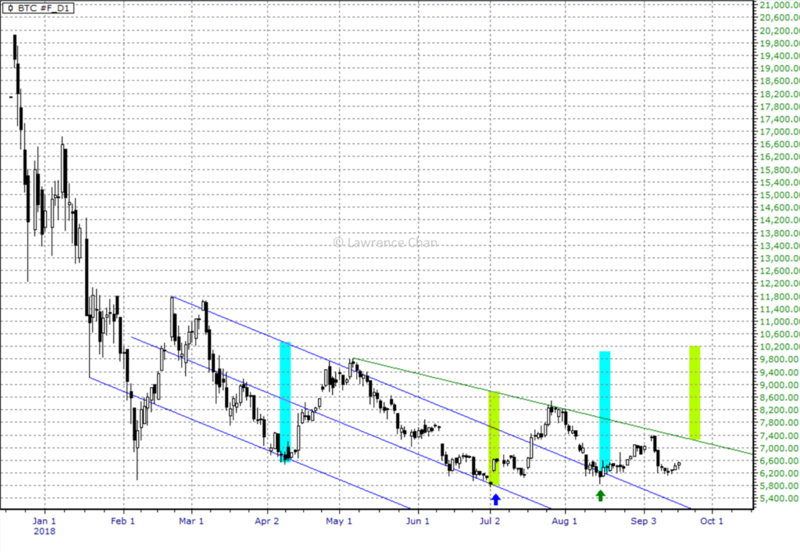 Here is the continuous Bitcoin future daily chart. 1. Bitcoin experienced the classic 75% crash from its all time high near 20,000. 2. Since the spike low back in February it has tried hard to settle down but just like any other market, post crash price actions are usually more bearish. 3. 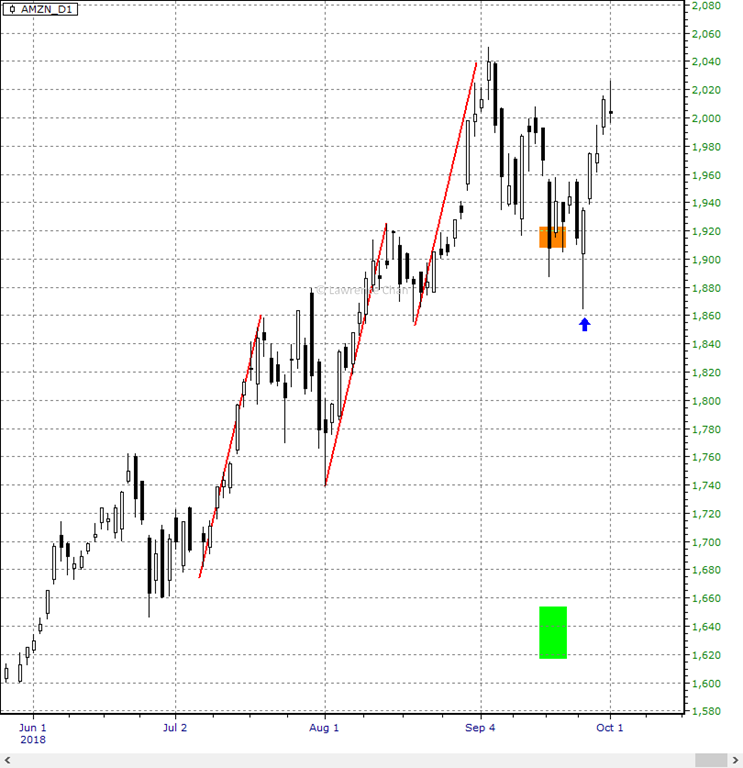 The down channel (blue parallel lines) like price action was terminated with channel mid reversal (blue arrow) and false breakout against first quarter low. 4. Breakout of the channel was meant with a strong selloff back down to retest the channel top and the first quarter low (green arrow). a. A clean breakout above the resistance trend line (green line) will likely give a run to target around 10,000.
b. IF, BTC manages to stay above 2nd quarter high after #a happened, it will in turn create the potential of what is often called Adam and Eve bottom. Whether the pattern will work out is too early to even think about it since the breakout part has not even happened. It is not that difficult to read a chart properly. Understanding how to engage the market correctly will keep your trading risk under control while the profits will take care of themselves as always. Get my book and learn my system of chart reading. 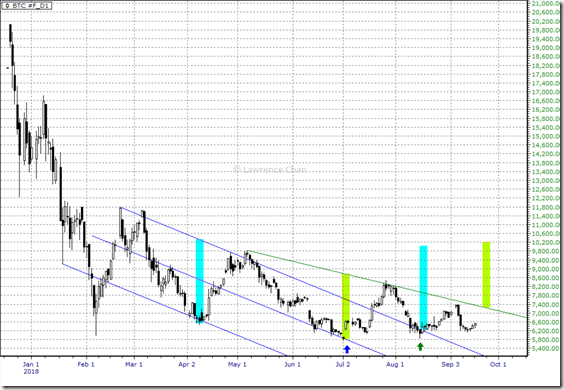 Not much changed since I last posted the weekly chart of Amazon. But if you know how to engage three pushes up, you would know what to do on the daily. Line in the sand is the orange zone, that turns into resistance will likely give us a move back down to the weekly targets mentioned last time. 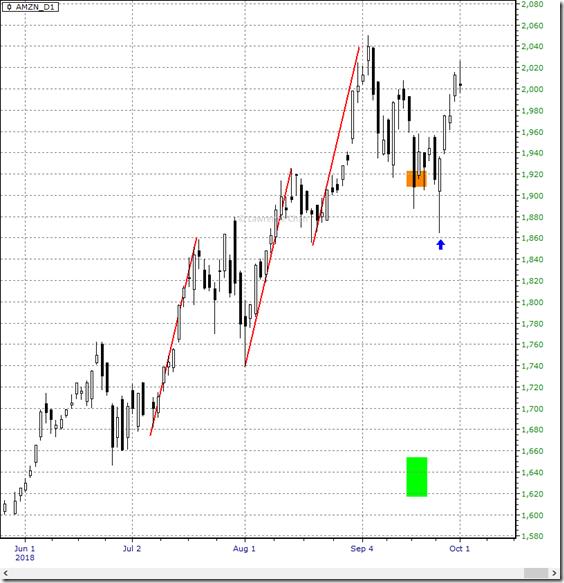 To learn more about the right way to engage various chart patterns, check out my book today. 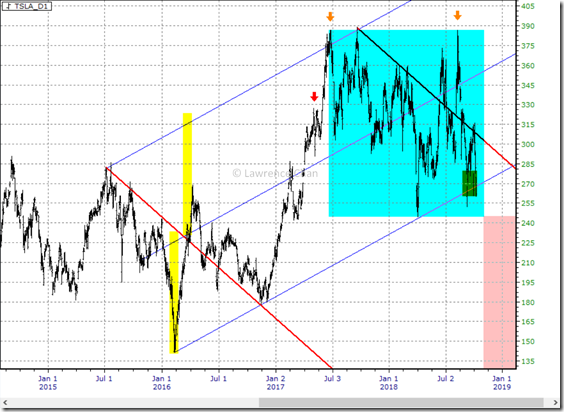 Before more downside is possible, takes care of the “unfinished business” first. 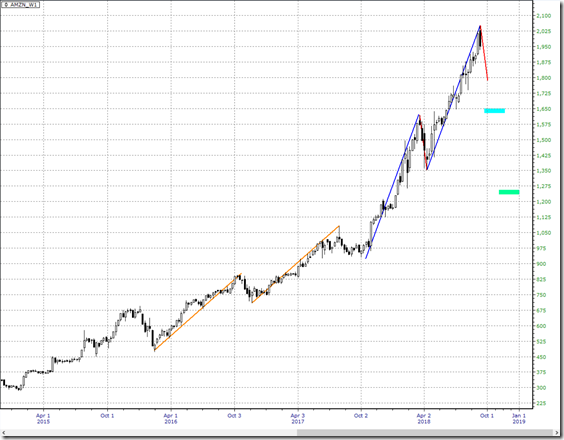 Here is a weekly chart of Amazon. Making measured moves in Amazon is part of its habit all the time. 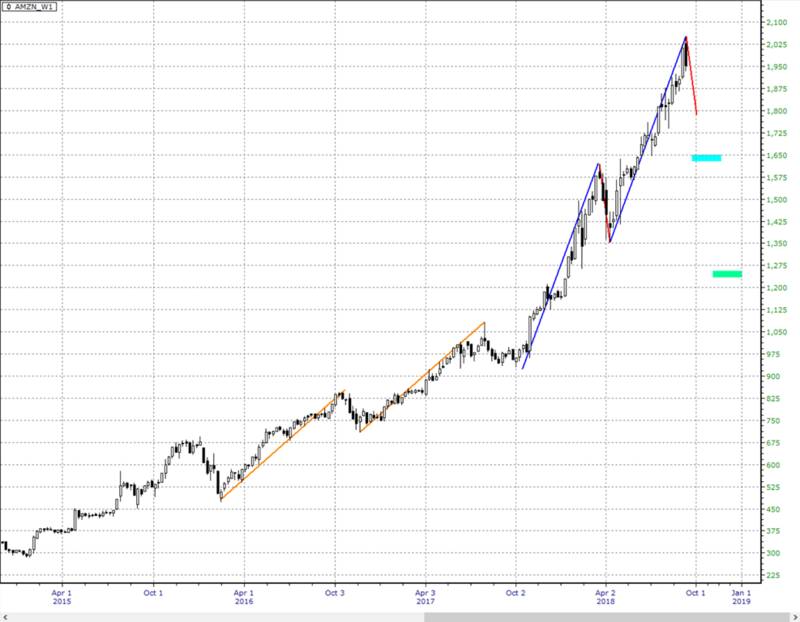 It is right on time to enter its correction / consolidation phase until the election is over. The key support areas are highlighted in the chart. If you want to be able to analyze your charts with better precision, pickup my book today! Follow up on my forecast made back on Aug 29. Here is where we stand. Really, there is a right way to read the charts. Forecast: Where is QQQ Heading as of Aug 29, 2018? Let’s guess when and where QQQ and Emini Nasdaq 100 will end this rally. 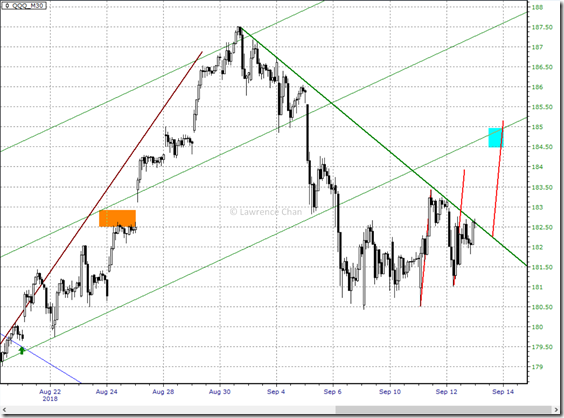 The chart below is just an update of what I posted last week. Everything lined up now for a showdown between bulls and bears right above. Looks like it is going to get this done by either the end of this week or beginning of next. From there it is more likely than not that we will have a month long consolidation / pullback.